EXIT 117 NORTHBOUND 0R SOUTHBOUND FOR HAZLET - KEYPORT EXIT. AFTER THE TOLL BOOTH, TAKE RIGHT FORK FOLLOWING SIGNS TO HIGHWAY 35 SOUTH [ NOT RT. 36] . PASS HOME DEPOT TO FIRST LIGHT AND TURN RIGHT ONTO HOLMDEL ROAD [ EXXON GAS STATION AT CORNER ], CONTINUE FOR APPROXIMATELY TWO MILES. 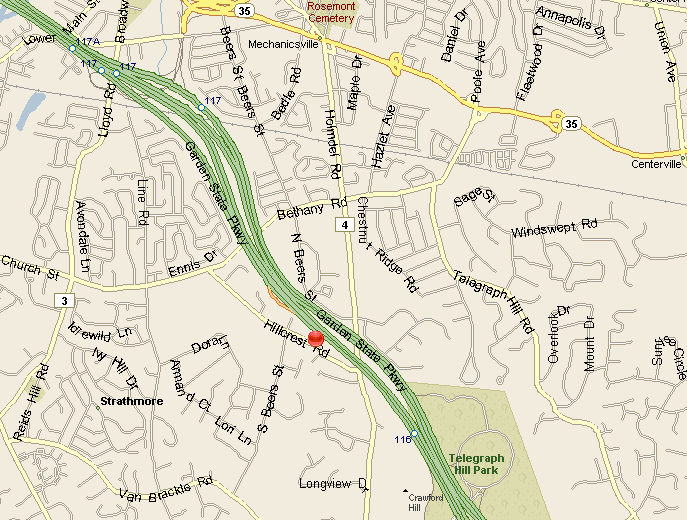 AFTER YOU CROSS-OVER THE PARKWAY, MAKE THE VERY NEXT IMMEDIATE RIGHT ONTO HILLCREST ROAD. 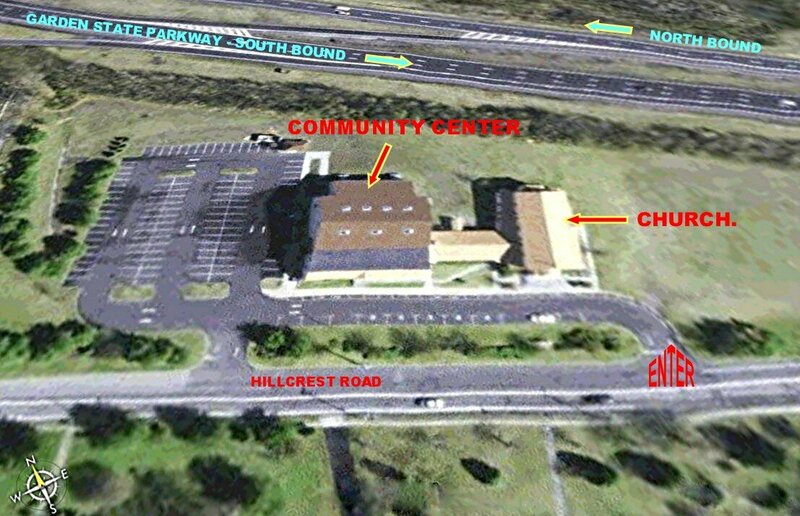 THE CHURCH IS APPROXIMATELY 300 YARDS ON THE RIGHT AT 20 HILLCREST ROAD. TURN ONTO HILLCREST ROAD ( BY ST. BENEDICT ROMAN CATHOLIC CHURCH ) AND CONTINUE TO KIMISIS CHURCH ON YOUR LEFT JUST PAST SOUTH BEERS STREET. ROUTE 79 NORTH TO LLOYD ROAD IN MATAWAN ( STREET BEFORE LLOYD ROAD IS TENNANT ROAD ON YOUR LEFT WITH EXXON GAS STATION ON YOUR LEFT ) AT LLOYD ROAD MAKE A RIGHT, IN ABOUT TWO MILES YOU WILL CROSS ROUTE 34. IN ABOUT 1 1/2 MILES YOU WILL COME TO CHURCH ROAD ( ALSO CALLED BETHANY ROAD ) MAKE A RIGHT AT LIGHT ONTO CHURCH STREET. ( AT THE NEXT LIGHT CHURCH STREET TURNS INTO BETHANY ROAD.) STAY ON BETHANY RD. TO HILLCREST RD.TURN RIGHT ONTO HILLCREST ROAD ( BY ST. BENEDICT ROMAN CATHOLIC CHURCH ) AND CONTINUE TO KIMISIS CHURCH ON YOUR LEFT JUST PAST SOUTH BEERS STREET. ROUTE 34 NORTH TO LLOYD ROAD IN ABERDEEN. (JUST PAST FREINDLY'S ON YOUR LEFT) MAKE A RIGHT ON TO LLOYD ROAD (BANK & GAS STATIONS ON CORNERS) IN ABOUT 1 1/2 MILES YOU WILL COME TO CHURCH ROAD (ALSO CALLED BETHANY ROAD) MAKE A RIGHT AT LIGHT ONTO CHURCH STREET. ( AT THE NEXT LIGHT CHURCH STREET TURNS INTO BETHANY ROAD.) STAY ON BETHANY RD. TO HILLCREST RD.TURN RIGHT ONTO HILLCREST ROAD ( BY ST. BENEDICT ROMAN CATHOLIC CHURCH ) AND CONTINUE TO KIMISIS CHURCH ON YOUR LEFT JUST PAST SOUTH BEERS STREET.